A criminal above suspicion. A team of detectives without a lead. A witness with an odd sense of priorities. A very unusual investigation indeed! 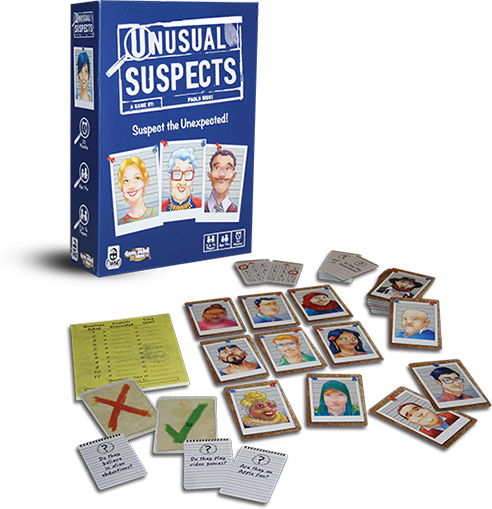 In Unusual Suspects, players cooperate to identify a criminal from a diverse suspects lineup. The Witness knows who the culprit is, but responds only ‘yes’ or ‘no’ to the questions asked. The catch? They only answers questions regarding the culprit’s nature, taste, and habits, not physical features. Detectives discuss and infer all kinds of backstories based on the suspects’ appearances. Eliminate the suspects that don’t fit theWitness’ answers as quickly as you can, but be careful you don’t let the actual criminal go! By Zee Garcia for The Dice Tower .